In early 2017, President Trump was widely ridiculed for alleging that the Obama administration placed his campaign under surveillance. The response from experts on CNN and other sites was open mockery. Former Director of National Intelligence James Clapper came forward to assure the media that he could categorically deny the allegation and stated, “There was no such wiretap activity mounted against the president, the president-elect at the time, or as a candidate, or against his campaign.” The range of media analysis seemed to run from whether Trump was a clinical paranoid or a delusional demagogue. We now know there was, indeed, surveillance ordered repeatedly on Trump campaign figures before and after the election. Rather than acknowledge the troubling implications of an administration investigating the opposing party’s leading candidate for president, the media shifted to saying that there was ample reason to order the surveillance. That remains to be seen but much of the coverage brushes over the fact that no charges were brought against the principal target, Carter Page, or that the secret warrants for surveillance were based in part on a dossier paid for by Hillary Clinton’s campaign, a fact known but not fully disclosed by the FBI to the secret FISA court. The documented Russian interference, thus far, has been largely a Russian operation out of St. Petersburg that special counsel Robert Mueller’s team has said was carried out without the knowledge of Trump campaign officials. Now the plot has thickened even further with the added disclosure of not just national security letters to gather documents related to Trump figures but also at least one confidential informant who met with campaign figures like Page and George Papadopoulos to gather information. In response to the New York Times report, Trump declared that the FBI planted “at least one” spy in his campaign to frame him. Trump counsel Rudy Giuliani ratcheted up the rhetoric and said, if the story is true, that former FBI Director James Comey should be prosecuted. The record does not currently support such a criminal conspiracy. However, if Trump and his counsel can be accused of overplaying the known facts, the media can be equally accused of ignoring the implications of the known facts. It should be a serious concern that the Obama administration used secret counterintelligence powers to target officials in the campaign of the opposing party. That is a practice we have widely criticized in other countries from Turkey to Russia to Iran. Worse yet, the New York Times wrote that the decision was made to use the secret FISA court and counterintelligence personnel to conceal the operation for political purposes. According to the report, FBI officials consciously decided not to seek conventional criminal warrants or pursue a criminal investigation because it might be discovered and raised by Trump during the campaign. Thus, as Trump campaigned against the “deep state,” FBI officials hid their investigation deeper inside the state. FISA was not designed as a convenient alternative for the FBI and the Justice Department to avoid political costs or scrutiny. The added problem with using a counterintelligence operation is that it is easier to launch and conceal than a criminal investigation. While there is a “probable cause” requirement under FISA, it is not the same as the one contained in the Fourth Amendment. Virtually every FISA application ever filed by the Justice Department has been granted, with a couple of exceptions. 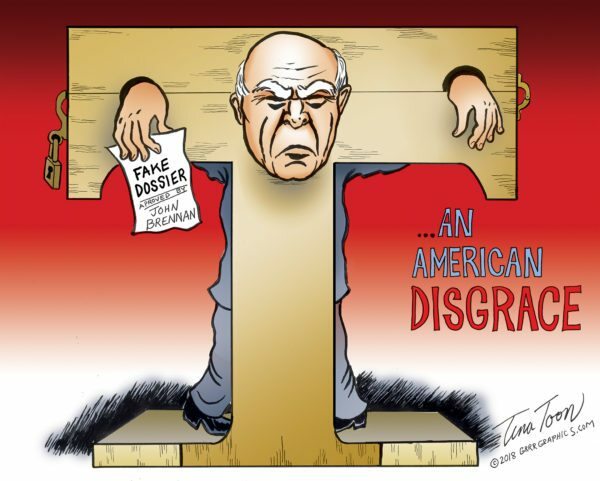 The FISA investigation was based on loose claims of foreign influence and a little cognizable evidence of actual crimes. For his part, Page continues to maintain that he accepted standard contracts to work with the Russians, as have hundreds of people in Washington. Clearly, the FBI should investigate any serious criminal conduct linked to Trump figures or the campaign. However, the publicly released FISA material describes interactions with Russians that could have applied easily to myriad other “Beltway bandits” who regularly cash in on foreign contracts, including leading figures of both parties. The still unresolved question is why these particular allegations of foreign contacts merited the extraordinary decision to target an opposing party’s campaign or campaign figures before a major election. I have been highly critical of Trump’s attacks on the media. However, that does not mean his objections are wholly unfounded, and this seems one such example. There may have been legitimate reasons to investigate Russian influence before the election. Yet, very serious concerns are raised by the targeting of an opposing party in the midst of a heated election. These concerns will be magnified by the use of a confidential source to elicit information from Trump campaign associates, though officials deny that the FBI actually had an informant inside the campaign. Just as it is too early to support allegations of a conspiracy to frame Trump, it is too early to dismiss allegations of bias against Trump. As shown by many of the emails and later criminal referrals and disciplinary actions at the FBI, an open hostility to Trump existed among some bureau figures. Moreover, the extensive unmasking of Trump figures and false statements from FBI officials cannot be dismissed as irrelevant. As a nation committed to the rule of law, we need a full and transparent investigation of these allegations. All of the allegations. That includes both the investigation of special counsel Mueller and the investigation of these latest allegations involving the FBI. For many Trump supporters, this new information deepens suspicions of the role of the “deep state.” If we ever hope to come out of these poisonous times as a unified nation, the public must be allowed to see the full record on both sides. Until then, many Americans across the country will continue to believe that, like “Jumpin’ Jack Flash,” Trump was greeted after his election by being “crowned with a spike” right through his head. the crazy thing about all this is that the FBI and CIA have accomplished what the Russians did not: invalidating the election, by showing that they believe themselves above the law and the democratic will of the American people. If they truly rue Putin as the baba yaga to America, then, they should surely step down from their exalted positions, because they have done his work for him. It’s been over a year. What have they found on Trump? But RIP my favorite Gunny Sgt. 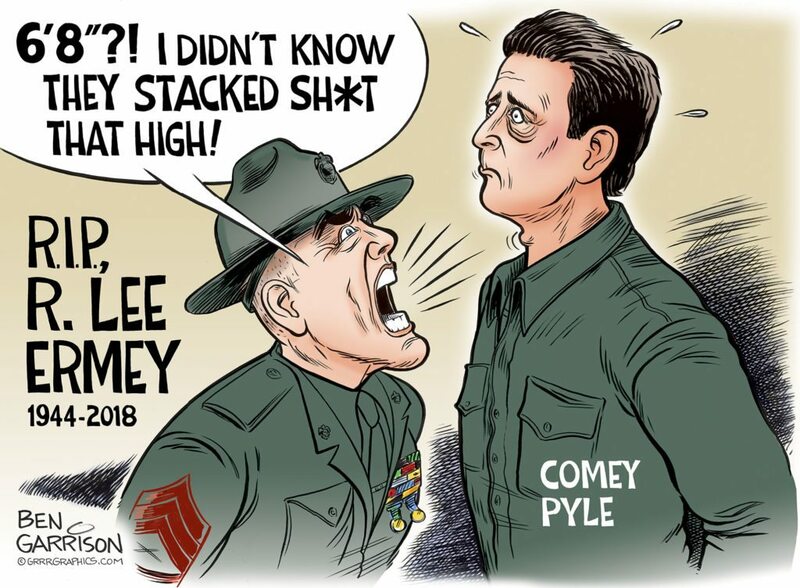 R. Lee Ermey! “It has to be medical experiments for the lot of you all”. LOL. Great TV interview with Clapper. He recounts being on a call with Trump about Trump’s nazi comments. Trump then asked him to refute the dossier. He is obsessed with it, isn’t he, and I don’t think it’s because he was worried about embarrassing Melanie, I mean, Melania. I’m so ready for the pee tape to come out. I didn’t hear the whole NPR interview, but during what I did listen to, he understandably didn’t address his previous excuse for committing perjury, namely that he gave Senator Wyden “the least untruthful answer” he could. Clapper obviously hoped that NPR listeners didn’t know that or had forgotten it. Rosenstein, Mueller, Comey, McCabe, Strozk, Page, Kadzic, Yates, Baker, Bruce Ohr, Nellie Ohr, Steele, Simpson, Hillary, Huma, Lynch, Brennan, Clapper, Kerry, Stefan “The Walrus” Halper, Power, Farkas, Rice, Obama et al. How do you know he can’t find any collusion? Has he told you? Do you have inside info? Or are you expecting him to telegraph out the results of his investigation, on a day by day basis?